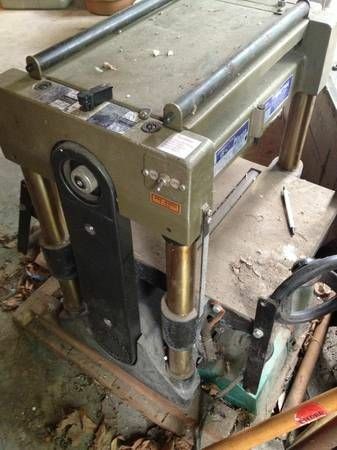 I found this 15” planer for sale in my local area. The seller says it is a Jet Tools, but doesn’t have any further info. Two questions: What model is it? Should I buy it given its apparent shape? A seller with no further info – run away! It is an estate sale. Loren nailed it.. what are they asking for it? Looks to be in excellent shape, but expect to have the rollers recovered as that is about the only weak link on those machines. Unless they are asking some stupid high price, I’d buy it in a heartbeat. $300 or something would be fair, $200 a bargain. to get the pair done). Thanks for the info. I’ll take a close look tomorrow and see if it is worth the $300 price tag. 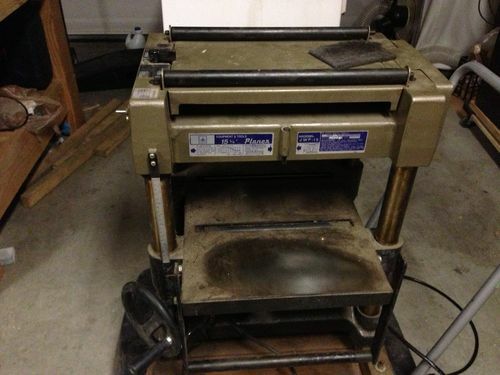 I assume I will have to do some refurb, but a 15” planer for that price is still awesome. Surprise. It is an old Jet JWP-15. It is covered in dirt and dust, but all the pieces are there, the motor sounds great and the knives feel sharp. I am going to clean it up, do a full checkup, and fab up some sort of dust collection adapter for it before I run any wood through it. The rollers look to be in great shape too. I even got a small manual with it. I should say that it is really just the same planer as mentioned above, but with a different name tag on it. None of the documentation has any year on it. Anyone care to take a stab? Also I find it interesting that the models could be roughly dated by color, but nowhere online can I find the rough transition years from blue to green to orange to white (might be missing a few in there). Prior to 1990, Jet was mostly just an importer.. and that machine looks identical to the Makita 2040 even down to it’s gold color scheme. The 2040 was made IIRC from the mid 70’s to mid 80’s. I don’t remember Jet ever selling gold colored machines, and it looks nothing at all like the current (or even older) JWP-15’s, so you will most likely have to look for Makita 2040 parts if required. Nice score.. how much did you wind up paying for it? I’ve been looking for a 2040 for some time.. currently I have two of it’s smaller brothers, the 2030, which is a combo 12 inch planer and 6 inch jointer. I have a Jet JWP-15-M I think from the 70’s. The main handle is in a other location and mine has a 5 hp motor. Also, I have a gear shift to change the feed rate that I don’t see on this one. The color looks about the same as mine. MrUnix. The color is a bit off. It is really a dark green, but under the garage lights it looks a little gold. I agree, even the documentation looks very similar to the Makitia 2040. I ended up paying 295 for it. Other than dust, it is in excellent condition. The down side is that the documentation says the motor is rated for 1400 Watts or 1.9 Hp. I may need to upgrade to a 3 or 5 hp motor later on. I have been very lucky with CraigsList over the past year. I picked up an 8” jointer that needed some TLC (I need to put that project up here soon), picked up a brand new shop fox dust collector for cheap, and now this. I am invested about $500 and I have over $2000 worth of machinery. Pretty awesome. It might say Jet, but it’s a copy of the Makita that I had. (Or my Makita was a copy of your jet.) I think I’ve still got an extra set of used knives laying around somewhere. I took the top part off and made a dust-collection chute out of wood, it’s just a couple of tabs holding it on. If it’s hard to crank up/down you can pull the rubber boot off the shaft underneath and clean it up. Mine was full of gunk by the time I got it.